The Sandiganbayan’s graft conviction of former first lady Imelda Romualdez Marcos finally came on November 9. The guilty verdict could mean different things to different people. But one thing is clear: the wheels of justice have moved in an excruciatingly slow pace for the Marcoses. The cases for which Mrs. Marcos was convicted — illegally maintaining private foundations in Switzerland while she was Metro Manila governor, minister of human settlements and member of the Interim Batasang Pambansa from 1976 to 1986, and earning as much as $200 million from the foundations’ investments — were filed way back in December 1991. It took nearly 27 years for the Philippine government to finally secure a conviction against Mrs. Marcos, who has been the global face of wanton abuse of power and corruption of the Martial Law regime in the Philippines. In two and a half decades, Mrs. Marcos was able to run for President twice: in 1991, or a year after returning to the Philippines from exile, and in 1998. She lost in both instances, but won a seat in the House of Representatives, representing her home province of Leyte in 1995, only to switch to Ilocos Norte, the bailiwick of her husband, the late strongman Ferdinand E. Marcos, in 2010. The former first lady is on her third and last term as a member of Congress and is set to mount a run for the governorship of Ilocos Norte this time. That she remains very much in circulation despite numerous accusations of corruption testifies not so much to the virtues of democracy in this country, but to the justice system’s systemic frailties. Further proof of this is the fact that a week after the guilty verdict, the Sandiganbayan anti-graft court has yet to release a warrant of arrest against Mrs. Marcos. Normally, the accused remains free following a conviction that has yet to attain finality because the accused has the right to appeal all the way to the Supreme Court. But the former first lady, in apparent defiance of the Sandiganbayan Fifth Division that tried her graft case, was absent during the promulgation of the court’s ruling on November 9. So was her counsel, Robert Sison. Yet Mrs. Marcos was present that very day at the birthday party of her daughter, Imee, at the Marcos mansion in San Juan. On Monday, she suddenly found the energy to file a motion for leave of the court to avail herself of post-conviction bail and switch to a new lawyer. The court is correct to find Mrs. Marcos’ absence during the promulgation “unjustified,” thus forfeiting, in accordance with the Rules of Court, the bail bond she had filed. With the cancellation of her bail, Mrs. Marcos should be arrested and compelled to explain herself before the Sandiganbayan. 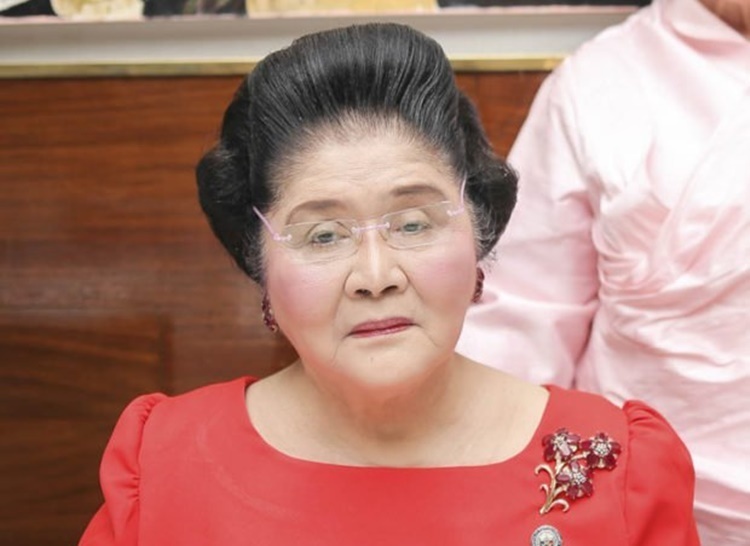 Mrs. Marcos’ advanced age (89) is being used as a factor in the argument that she must be given special treatment, and again, witnesses to the absurd flamboyance amid the sufferings of the poverty-stricken and the oppressed during her husband’s regime would find it revolting that there is already talk of securing a presidential pardon for her. There should be no special treatment for a public official who has taken advantage of the infirmities and loopholes of the legal system to avoid accountability. Government prosecutors should, instead, go a step further and oppose Mrs. Marcos’ candidacy for governor of Ilocos Norte. She has already been adjudged guilty of crimes against the people, albeit without finality. She should, therefore, be declared unfit to run for public office because of her record of abuse of power and corruption. Imelda belongs behind bars, not in the halls of government.